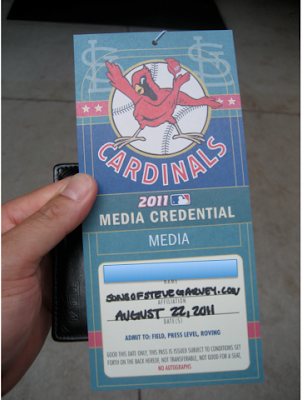 We wanted to get to the field early because, as you already know from Part 0, SoSG was able to secure press credentials for the game (thanks to Josh Rawitch of the Dodgers and Terry Rodgers of the Cardinals). And really, this was the opportunity of a lifetime. After a quick nap at the hotel, we were off and running--ready to cover the game as "media"! We can just leave our car out front of the hotel, right? Okay then. Our hotel was a stone's throw from Busch Stadium, and on the way we passed the St. Louis Metro line...which has a stop right at Busch. A public transportation stop right at the stadium! What a novel idea!!! Busch Stadium employees were already trickling in for work. 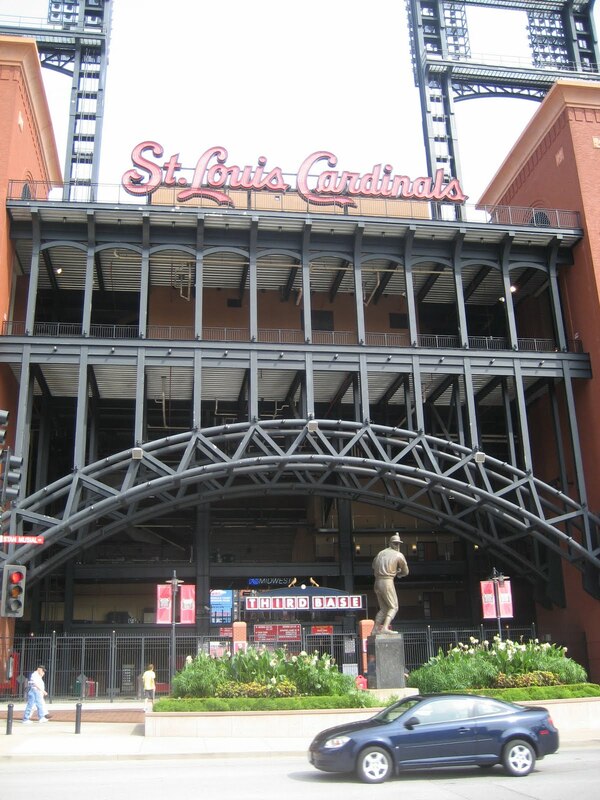 Busch Stadium facade, with its beautiful brick work and majestic iron arches. I had been to the old Busch Stadium about a decade ago, but the Cardinals were not in town and so all I could do was walk around the stadium at night (I remember it being a big circle, unlike this newer model which is more square-like in shape). We didn't get to go all the way around this newer model (the new Busch Stadium opened in 2006), but I was really impressed at what a great job they did--especially considering that they had to rush to complete new Busch Stadium in between the end of the 2005 season and the start of the 2006 season. To be fair, much of the right field was already completed before the 2005 season ended; and, one Busch employee told us that there were "a lot of problems" in that first season, particularly in the new section (he didn't get into what those problems were). But the end result is a seamless model which stands tall and has a lot of neat sights outside the gates, not just inside. 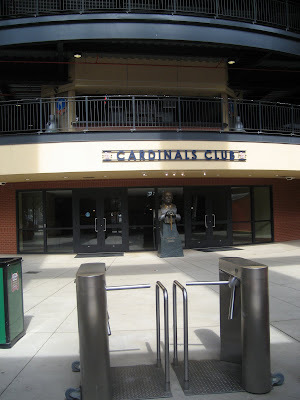 The brick pathway around the stadium has center plaques dedicated to some of the Cardinals franchise's highlights, with inscribed and donated bricks surrounding each plaque. Here's a shot of the sidewalk. And here's a shot of one of the plaques in particular. Then at the corner of Clark and Eighth Streets, there are all these statues (I forgot to count how many) of the Cardinals legends. They're small, but they're also very detailed in their faces--which I'll reference later, was key. Lou Brock, on a tear. The Brock one was especially notable for me since we passed Lou Brock in the Stadium depths, one the way out of the stadium well after the game had ended. He stood out--he was being carted around with three other people, and was wearing a pink long-sleeved button down shirt that had a Cardinals patch on one sleeve. I thought it was Brock, but I wasn't sure. After we left the stadium, I ran back to his statue and confirmed it; sure enough, it was Brock. Or at least, someone who looks incredibly like his statue. Bob Gibson, hurling with all his fury (I really liked the energy emanating from this one's pose). There was this scavenger hunt thing going on, so we were descended upon by a horde of polo-shirt wearing dudes and dudettes while looking at the statues. 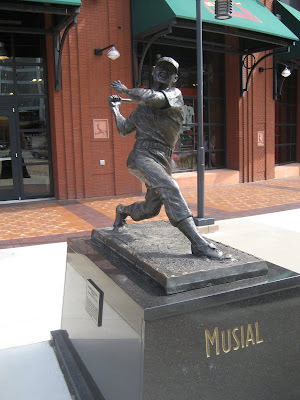 The Stan Musial signature piece from the front sidewalk. The view right inside the gates into the Cardinals Club. No one has been let into the Stadium...yet. Literally, my hands were trembling. How could I effectively pose as media when my first instinct was to start giggling like an thirteen-year-old schoolgirl? After a couple seconds to get ourselves together, we headed into Busch Stadium, making a beeline for the field. 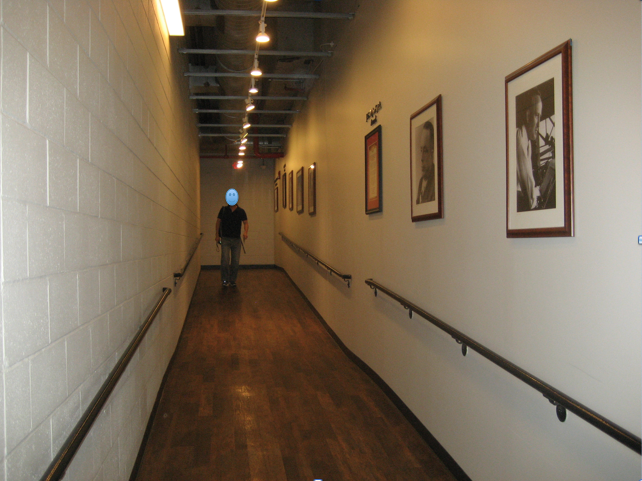 Down the ramp, into the tunnels below Busch Stadium. Look at those views of the city and arch! To the left of the protective fence, inching our way toward the field. There was one gate that allowed on-field access, guarded by a gentleman you'll meet later. We showed our press passes and walked on through...to stand on the field at Busch Stadium. This was amazing, and I had to take more photographs as I tried to take it all in. The center-field scoreboard, in detail. Up the left field line was the outfield wall with Cardinals legends (I didn't know outfield walls didn't need to have just advertising on them! Cool!). Here's a picture of my shadow on the field. We were near the third-base, visitors dugout and there were no other Los Angeles press folks in vicinity. 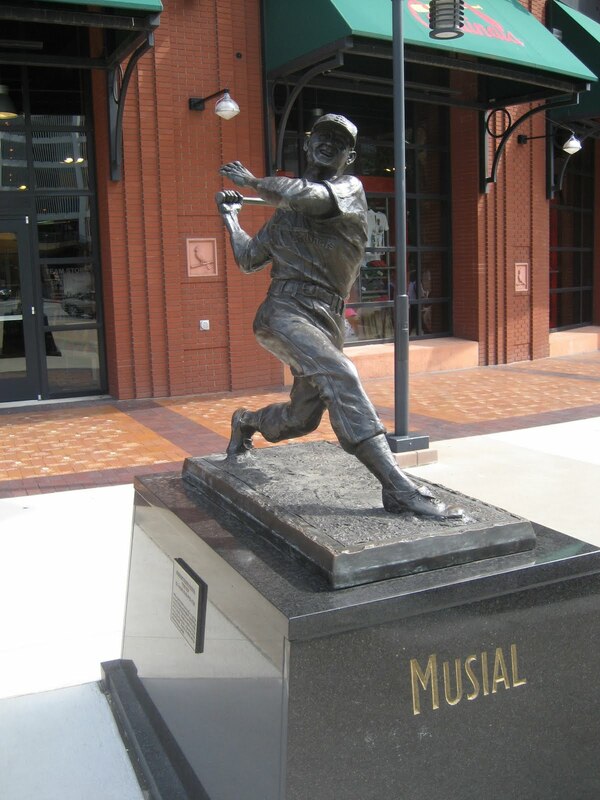 I remember reaching down and feeling the dirt of the warning track, and putting my hand on the Busch Stadium grass (we were told to stay on the track itself). But this was it, just me and SoSG AC, standing on the grass at Busch Stadium. This sort of access was just unbelievable. Off the top of my head, I can only recall being on the field at Kansas City (on this road trip), and of course Dodger Stadium, and it's always a neat experience to look up and think about what it must be like to play a sport with 35,000 to 50,000 people staring at you, from multiple levels of the stadium, cheering you on mightily or booing you lustily. One can't help but feel microscopically small amidst the towering tiers of the stadium. It's enough to send chills up one's spine. 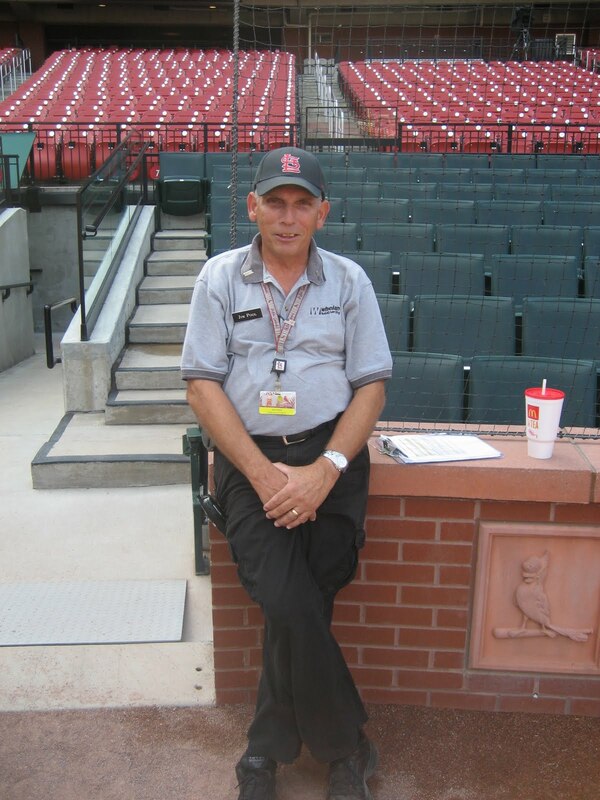 And this is Jim Pool, the man who worked the gate behind home plate before the game at Busch Stadium. Jim and I had a nice conversation; he's worked with the Cardinals for years and still enjoys doing it. He was a hoot. And then, a small handful of Dodgers emerged for some very early pre-game activity. We ended up seeing Jonathan Broxton out in left field playing catch under Stan Conte's supervision, and then Rafael Furcal came running out of the Cardinals' dugout to give Conte a hug. SoSG Alex Cora caught a picture of Raffy as he was coming back; we said hi and he waved to us as he snuck back into the Cardinals' dugout. Raffy and Stan Conte embrace in left field. There were also some Cardinals doing windsprints over in right field; one Cardinal was using a parachute trailing behind him for resistance. Apparently "Little Pujols," Albert's son, was also out there, and I recall him doing one sprint with the parachute as well. Jim Pool said that Albert Pujols' son was eight years old or so and was already pretty skilled at shagging long fly balls during BP. Heck, I don't think I could even do that, now. 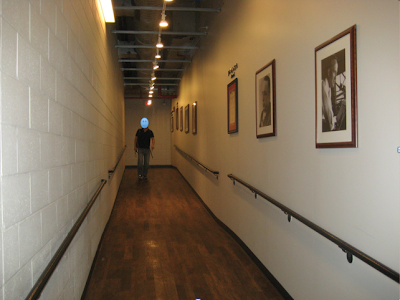 Next up: Part 3: Inside Busch Stadium, before everyone else.